Union Square — Close to the Heart! The old saying goes “Home is where the heart is!” – and Union Square is a great place to call home. 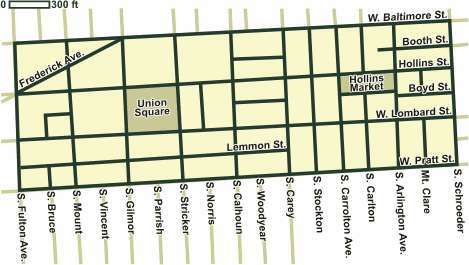 Another fundamental is “Location, location, location!” Union Square is Baltimore’s BEST location! The heart of the city offers diverse and lively events: cultural, social, dining, and sports – just to name a few. Appealing as these features are, living in the heart of the city is a very different thing – there are issues of traffic, restricted parking, cramped quarters and noise. That’s the beauty of having a home in historic Union Square. “Close to the heart” with none of the drawbacks, Union Square is a cosmopolitan mix of residential comfort and urban excitement. This historic neighborhood, one of Baltimore’s friendliest, is marked by pre- and post-Civil War architecture, period street lamps, brick sidewalks and stately row homes. An uncommon synergy prevails in the neighborhood as residents, both longtime and newly-arrived, work together through various committees and forums to enhance the area’s quality of life. Union Square — Baltimore’s BEST location! Close to the heart of the City. Less than a mile from Camden Yards – the finest baseball stadium in the land – the Union Square/Hollins Market Historic District is situated on the rich historical ground of Southwest Baltimore (known to locals as Sowebo). The Inner Harbor, B&O Railroad Museum, Ravens Stadium, University of Maryland-Baltimore and the brand new BioPark are all within walking distance. A public golf course is nearby, next to the newly-renovated Montgomery Park office building. Access to I-83, I-95 and the MARC commuter train to Washington D.C. are minutes away. “The Sage of Baltimore” H. L. Mencken's lifelong home is at 1524 Hollins St. The Neighborhood Design Center, whose mission it is to assist in building better communities, is housed in the former No. 2 Pratt Library building (now beautifully restored) at 1401 Hollins St.
Viva House, a Catholic outreach center is at 26 S. Mount St. The awe-inspiring Black Cherry Puppet Theater, founded in 1980, is near Hollins Market. Black Cherry has long been entertaining children with performances and educational workshops in schools and festivals regionally. In addition to their theater, the group features a garden performance space, studios, and a Puppetry Resource Center. There are a variety of regular neighborhood recreational events. As you explore this site, you will also find an assortment of tourist attractions and other local resources. Over 40 professional artists live in Sowebo. This includes some of the area’s earliest pioneers, people who transformed dilapidated properties – old bath houses, chicken factories, collapsed mansions – into attractive housing, work, and gallery space. Their investments have sustained a unique community, which is now a foundation for much needed revitalization. The Sowebohemian Festival is held annually on the Sunday of Memorial Day weekend. Coined a “Topsy Turvy Excursion into Art and Music,” the festival presents Baltimore's largest music venue (40+ bands), a sizeable non-juried art exhibit, puppet shows, art and craft demos, outdoor sculpture, kid’s art & fun. Artists living beyond its borders value Sowebo. Every year, 60+ local and regional artists donate original works for a most popular signature event, the Sowebo Poster Show and Auction. The show is hung in area cafes and other venues every May. The funky June auction is an incredible way to obtain original art. For more information, click here. 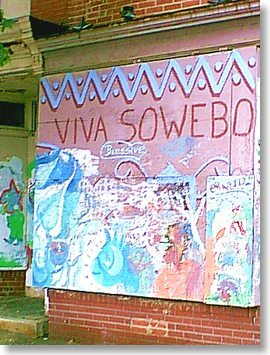 Information about Sowebo Arts, Inc. is courtesy of the Sowebo Arts Inc. web site – for much more information, and to view the extraordinary “Soweboposters” by some of Baltimore’s hippest artists, go to the Sowebo Arts Inc. web site. Click here. Thank you to Betsy Nix and Frank Trovato for the inspiration and the links! One of the most popular events in our neighborhood is the Annual Christmas Cookie Tour. Union Square residents usher in the season in style as hundreds of visitors tour lovingly-restored homes of Baltimore’s Victorian era. Christmas decorations provide a festive backdrop as guests munch freshly-baked cookies, sip a hot cider or two, and get to meet the friendliest folks in Baltimore. 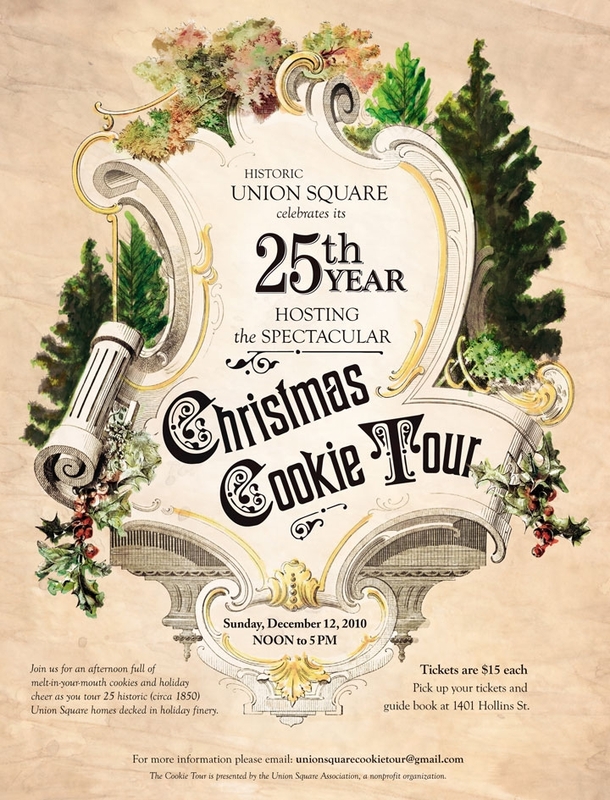 The Union Square neighborhood welcomes you to our annual Holiday Cookie Tour. We hope you enjoy the afternoon stroll through our National Register of Historic Places district, and through the many fine 19th century homes opened for your pleasure. If you are new to our tour, you may be surprised to find that while we are very consistent in our views of proper Victorian streetscape, we vary widely in our concepts of interior decor. Our homes run the gamut of style from country to contemporary, with eclectic coexistence as a common rule. You may also be surprised to find an extremely strong sense of community among our “family” of neighbors. We all know one another, and we work together – not only in rebuilding our homes, but also in rebuilding this fine neighborhood. This tour, which benefits historic preservation and local charitable efforts, is but one example of the spirit that makes Union Square a great place to live. An hour before the event, neighbors gather to clean the park and help the Easter Bunny hide treats for the children who arrive later. Families then share the magic as little ones scour the park looking for candies and other surprises. After a long, cold winter a number of Union Square homes are the site of a neighborhood get-together to share the love just as spring arrives. Forty to sixty people gather for appetizers, cocktails, dinner and desserts for a great night of story-swapping and socializing. Pumpkin carving, treats, and costume parade for children of all ages! Fun and fund-raising come together as neighbors set up tables and meet in the park to sell their wares. Over the years, this fund-raiser has supported children's programs at the festival, the Southwest Baltimore Charter School (SBCS), the Southwest Senior Center and other worthy causes.